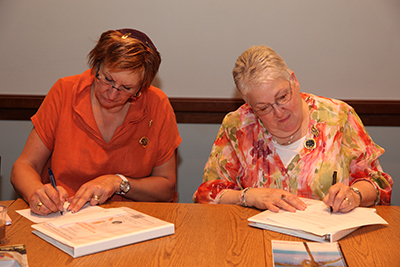 Women’s League provides publications and resources directly into the hands of the women who run their sisterhoods. As members of Women’s League you can download or access on line these materials and services. PrezNet: a moderated, online discussion group open to all sisterhood presidents. PrezNet is a personalized resource, a place to post questions and share and learn about successful programming and strategies. Judaica Shop Listserv: Just for chairs of Judaica shops, this is an informal but exceedingly helpful resource for sharing ideas and answering questions. Sisterhood President’s Pin: This beautiful, two-toned pin is available to present to any sisterhood president, new or outgoing. The cost is $68.00 per pin. The best way to update your sisterhood membership data, officers and activity chair proflies is online. If you are a sisterhood president, financial officer, or designated data manager you have direct access to the information about your sisterhood in the menu to the right. Download the Sisterhood Presidents Guide for directions and additional information. If you prefer, download the forms here, fill them out, and email them back to womensleague@wlcj.org.